Are you embarrassed by your yellow or stained teeth? Although it probably took years for your smile to become dull, it only takes one professional teeth whitening session to improve the appearance of your teeth. Dr. Kunio Chan, your Billerica, MA dentist at One Dental Care, shares the advantages of professional teeth whitening. Quick Results: Kits often require you to use the product several times a week for weeks at a time. Professional whitening only takes one one-hour visit to your Billerica dentist's office. If you would like your teeth to be a little whiter, you can always return for an additional session or two. Reduced Sensitivity: Teeth whitening agents can irritate your sensitive gums and roots and cause pain for several days after you use a whitening product. Before the whitening process begins, your Billerica dentist applies a protective gel to your gums and roots. He also uses retractors to pull your cheeks and lips away from your teeth, protecting these sensitive tissues from irritation. 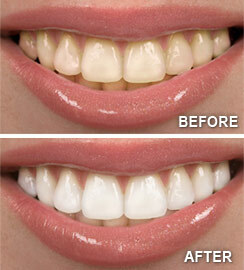 Do you want a dazzling smile with teeth whitening treatment? Call One Dental Care in Billerica, MA at (978) 667-0691 to schedule an appointment.